They’re typically lighter yet spacious, more stable, and easier to handle. While catamarans have been cruising the seas for ages, it has only recently been caught on by boat buyers how advantageous they are compared to mono-hulled yachts. In the past, catamarans don’t quite look right. When people go shopping for a boat, they want it to resemble their perceived image of a boat and the catamarans of yesteryear simply didn’t cut it. However, manufacturers have continued hawking newer and modish models each year. And it seems they’re getting better at making catamarans look like the superyachts we know and love today. Practically all set for ergonomic design, accommodations are more comfortable on catamarans. Saloon areas of most mega multi-hull yachts also offer 360-degree views. In a nutshell, two hulls is really better than one. Here’s five power cats you wouldn’t want to miss at the Singapore Yacht Show 2018. Making its Asian debut at the 2018 Singapore Yacht Show is this French-built motor catamaran. 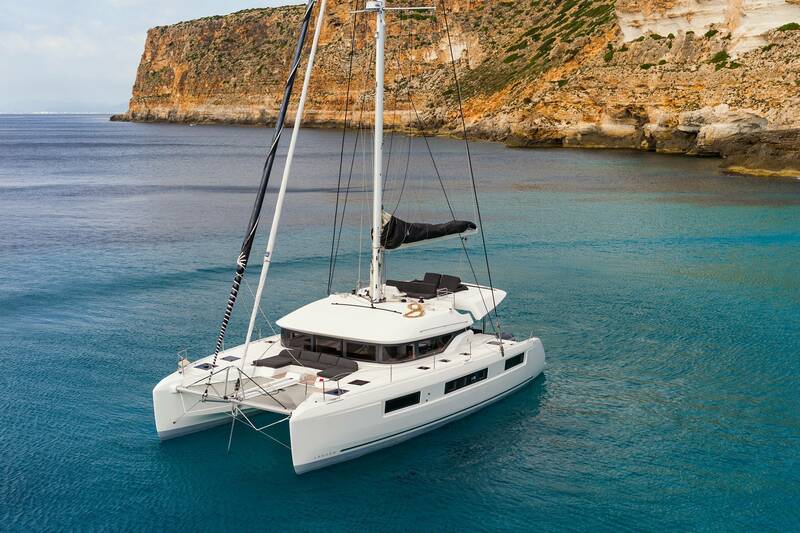 The Fountaine Pajot 44 will be presented by Australian and Thai company, Multihull Solutions. She is ideal for long-range cruising and can achieve top speeds of 30 knots with optional 435hp Volvo Penta IPS600 engines. But the most distinctive feature is the space she offers. This 13.4m-length catamaran has a combined living and accommodation space of over 530sq-ft – more likely found in a much larger boat. Exclusive distributor Simpson Marine will be presenting another Asian debut from another French yacht builder: Lagoon Catamarans. The Lagoon 50 oozes European sophistication and is the perfect compromise between the brand’s popular 450 model and the 52. At an overall length of 14.75m, she provides generous volume and panoramic views. Choose between having your boat in a three-, four- or even six-cabin configuration. The Aquila 44 to be showcased within Simpson Marine’s exhibition space on the marina during this year’s Singapore Yacht Show recently handled extensive cruising on the American west coast, achieving 18 knots of speed with superb sea handling. She’s 13.44m in length and has three cabins. The Aquila 36 is the newest addition to Florida’s Aquila fleet of motor catamarans. It is the most innovative yet. With the incredibly efficient and quiet twin Mercury Verado outboards (with options of 250hp, 300hp or 350hp), spirited performance of up to 30 knots and excellent fuel economy can be attained. US-based Leopard Catamarans will have a staggering display of four catamarans at the 2018 Singapore Yacht Show – two power and two sail. Built in South Africa by Robertson and Caine, the largest of the Leopard Catamarans you will find at the show is the Leopard 51, a 15.5m power cat available in a three- or four-cabin configuration.